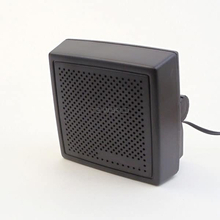 This professional heavy duty external CB speaker is a favorite among professional drivers and heavy equipment operators. It provides a loud, clear sound that is hard to beat! The speaker is 4.75" square and 2.5" deep. With the mounting bracket attached, it is 3" deep. The mounting bracket is 3 13/16" wide and 1 5/16" deep at the base. The connected speaker wire is 6 feet long. The included mounting bracket attaches with two thumbscrews. The bracket can rotate 180 degrees and lock-in anywhere in that range for mounting. There are holes for mounting on the bottom and back of the mounting bracket for mounting on the floor, dash, roof, or any vertical or horizontal surface. Measures 4.75" W x 4.75" H x 3" D with the mounting bracket attached 2.5" D without.